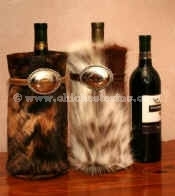 The wine bags are lined with velvet and measure 11" high and 5" in diameter. They make ideal hostess gifts. Cows are not endangered. The skins are a by-product of the food industry. There are no restrictions on the export of this item from the United States. Click HERE for Cow Hides. Click HERE for more Cow Skin Products.